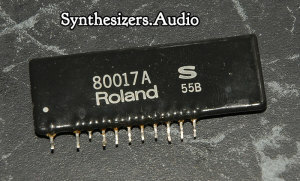 Many people who have owned, or still own a Roland Juno 106 synthesizer are aware of the infamous 80017a filter chip failure. 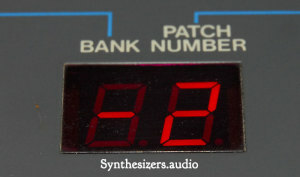 Being a six voice polyphonic synth, the Juno 106 contains six of these chips, one for each voice. When they fail, they typically cause either a loss of sound from the affected voice, or a crackle that usually gets worse as the synth warms up. Click any of the images below for a larger view. There are a number of options available to remedy this fault. If you are not experienced with a soldering iron, the best option is to send your synth to someone who is qualified and has the available tools and experience to do the repair for you. If you ARE experienced with a soldering iron, then there are a number of DIY repair options. I will state at this point that the Juno 106 PCB is double sided, through hole plated and removing these chips is not easy, unless you have a dedicated, temperature controlled, vacuum desoldering station. I do provide a much easier alternative further down in this article to the traditional desoldering methods though. If you decide to give this repair a shot and damage your Juno 106 in the process, I am not responsible for any damage you cause!! You undertake these repairs at your own risk. If in doubt, get someone qualified to do the repair for you. Once you’ve located which chips are faulty, write down the voice numbers indicated on the LED display. Next, you need to decide whether you want to fix the Roland chips or buy replacement ones. If you decide on the latter, the best replacements are available from analoguerenaissance.com. 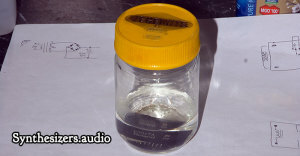 If you decide you want to try to repair the Roland chips, you’ll need a glass jar with a tight fitting lid and a container of 100 percent pure Acetone. Once you’ve removed the faulty Roland chips, you’ll be soaking them in Acetone for a number of days to soften the black resin coating before removing it carefully. In some cases, removing this coating removes the faulty symptoms, albeit for a limited amount of time until the underlying cause of the fault which is dry solder joints on the components surfaces again down the track. It is quite acceptable to put these chips back in without re-coating them in anything. If the Acetone soak does not fix your chip/s and they still either crackle or intermittently produce no sound, you will need to continue with a proper, long term repair. The main cause of faulty chips is poor soldering. Repairing this fault involves delicate surface mount soldering and requires ADVANCED soldering skills and a very fine tipped soldering iron. I will cover this repair in part two of this article. Even if you have success just by removing the resin, your chip/s WILL eventually fail again and require complete resoldering. The next step is to disassemble your Juno 106. This may seem obvious but make sure the synth is UNPLUGGED from the mains (not just switched off) BEFORE you take it apart. Mains voltages are LETHAL! The PCB we are interested in is the large one on the far left of the base of the Juno, known as the Module Board in the Roland service manual. You’ll see I’ve already repaired voice chip two using the Acetone soak method. This time, it is voice chip one that has become noisy in my Juno. I have no doubt I’ll have to do this repair to all the chips eventually. Also, the previously repaired chip needs re-seating in its socket. Update; this chip needed the resoldering repair due to dry (AKA cracked) solder joints and I’ve done that repair since writing this article to ALL my 80017a chips. I also invested in a proper, professional, temperature controlled, vacuum desoldering station making the desoldering job MUCH easier. Before undertaking the following procedures, you might want to invest in an earthing strap. This is basically a wrist strap with a cable attached to it with an alligator clip attached to the other end which you connect to a ground point and/or desk mat on your work bench. These can be obtained from most electronics supply stores. The PCBs in the Juno 106 are static sensitive and can be damaged by stray electrostatic charges that can build up in your body. The earth strap and mat discharges these buildups and prevents you damaging the PCBs when handling them. You can choose to continue without an earthing setup but be VERY CAREFUL when handling the PCB and the components. I do not personally have an earthing setup like this and have not damaged any of the synths I have worked on over the last thirty years but I am very experienced in electronics and know the dangers. I am very careful when handling the PCBs and components. 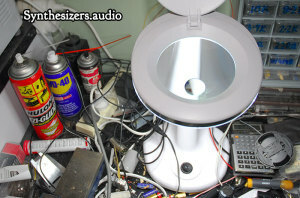 Again, if you damage your Juno 106, I am not responsible for the damage! Continue at your own risk! If you are worried about this, get someone who is qualified and experienced to do the repair for you. OK, with that said, if you have not been scared off, let’s continue! Next up, unplug all the connectors on this PCB. There’s no need to label them. The only two that are right next to each other are different sizes so it is obvious where they go. Besides that, the wiring loom keeps the connectors all in place. After you’ve unplugged the PCB, remove the six screws holding it in place and the board will lift out. Here’s a shot of the Module Board from my Juno sitting on my work bench with the repaired chip and the current faulty chip both removed and sitting above the PCB. By far, the easiest method of removing a faulty chip is not by desoldering it first (once again, unless you have a professional, temperature controlled, vacuum desoldering station) but by GENTLY bending it back and forth until all the pins snap away from the PCB. This will require quite a few gentle bends back and forth but it will come out eventually. Do not become impatient with the chip. Treating it roughly can easily damage it or the components near it. Be GENTLE! Later on, we will be removing the remains of the pins one at a time simply by heating them and pulling them out with a pair of needle nosed pliers. 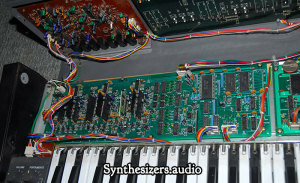 Special note for HS60 & Juno 106s owners (these two Juno 106 variations have inbuilt amplifiers and speakers): The module board is mounted under the keyboard in these models and there is VERY LITTLE clearance between the 80017a chips and the bottom of the keyboard. Therefore, the chips will not have enough clearance if they are fitted with new pins and re-fitted to the module board in sockets as described later in this article. You will need to remove the chips with their pins intact and resolder them directly to the module board once done. I HIGHLY RECOMMEND getting a good quality temperature controlled, vacuum desoldering station to remove the chips. Thank you Olof for the additional information (see comments section below). If you need to remove more than one faulty chip, MAKE SURE YOU KNOW WHICH ONE IS WHICH. Even though they are the same design, they are made with components with varying tolerances and have slightly different characteristics. If you swap them and put them in different places, each voice will sound slightly different unless they are re-calibrated. 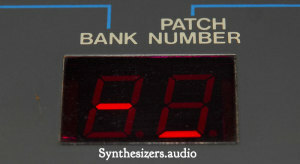 If you use the analoguerenaissance.com chips, you will need to do the re-calibration anyway and you’ll need the JUNO-106 service manual which outlines that procedure. The procedure is pretty simple but you will need the right tools (an oscilloscope, a digital multimeter and a frequency counter or tuner) and the knowledge to use them. If you repair and replace the old chips and put them in the same positions they came from, theoretically, you should not need to do the alignment procedure. However, if you are up to it, you may want to do the alignment anyway. These synths are now around three decades old and mine was WAY out of alignment. After we have soaked the chip in Acetone and removed the resin casing, we will solder on some new pins. You might want to invest in a magnifying lamp for this work. They are well worth the investment and invaluable for checking your work for shorts and broken PCB tracks. In the following parts or this article, we’ll remove the resin from the chips, replace their pins, resolder the surface mount components on the chip/s (an optional but highly recommended extra step which permanently fixes the real cause of these chip failures), remove the remains of the chip pins from the Module Board, fit sockets to the PCB, plug the chips back in to the Module Board, refit the PCB into the synth, test everything and do the final reassembly. I also recommend downloading the service manual and doing the alignment if you have the tools available. Would you be interested in fixing my 80017a VCF/VCA chip? I tried soldering in the new one from analoguerenaissance. but I am not getting any sound from that voice. My apologies for the delay getting back to you. I had a computer hard drive failure recently and had to restore much of it manually from a backup that half worked!! I’ll send you an email and we can touch base regarding your 80017a chip. Don’t know if your still going? As this page says 2014! 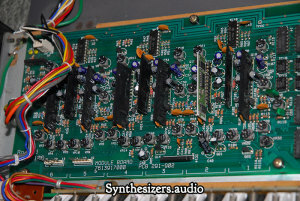 If you are, and you are still fixing voice boards, I would like to know if you could fix my board on my Juno 106 as the sixth chip is gone I think, sorry about the “I think” bit bug it’s been over a year since I removed it ready to send into someone to fix but held off as I heard things were not always right with the repairs / replacements. I want to keep it as original ad possible so I don’t want a replacement board, just a chip repair. Can you contact me so we can discuss repair and costings etc please? I am indeed still going and have just moved my home and studio to a new location. I’m planning to make some more tech related posts here soon enough but have much to do setting up the studio in its new location first. I’ll send you an email and we can touch base regarding the chip repairs on your Juno. I have a Juno-106 that has one voice that is “hanging”…it is always present in the background. Would you know if this is also caused by a voice chip issue? Yes, indeed that fault can be, and often is caused by these chips going faulty. Is the stuck voice lower than full volume? Is it noisy? These are both common symptoms of the VCA section being at fault. Yes David, it is at a very low volume. No real noise associated with it. I noticed people asking you to repair their Juno. If you do offer that service, please let me know how I can go about hiring you. Sending you an email now Alex. I have had my 106 for a while now and all was fine I was working with it the other night and it just didn’t sound right. I did the test and it seems to be voice 6. Would you please email me with a price for fixing this. Music just ain’t the same without the Juno. My apologies for the late reply Andrew. For some reason, I missed the email notification of your reply here. I’ll be in touch via email shortly. Just wanted to thank you for this great step by step tutorial. I’m a happy owner of a HS-60, (the juno 106 with built in speakers) and followed this guide with good results. Fun fact: in the HS-60 the module board is located right under the keyboard section, since the speakers take up quite a lot of the interior space of the synth. Hence there is just not enough space to fit any sockets on the module board, since the clearance between the top of the voice chips and the keys is not more than maybe 10 mm. Luckliy, I realised this before applying the “wiggle-and-snap” approach to removing the chip, and went on and desoldered it instead. Might be a good idea to add a warning about this for other HS-60 users, to make this already awesome tutorial even better! Thank you very much for the thumbs up on the clearance issue Olof. I shall update the article with the additional information. Great to hear you have your HS60 up and running again. Thank you too for the kind words.